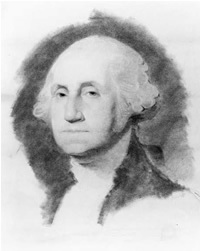 George Washington (1732 - 1799) was born in Virginia to a wealthy family that owned multiple tobacco plantations. A surveyor by trade, he made a name for himself early on and rose quickly in the ranks of the British army, ultimately changing sides to lead the American Revolution and become the new country's first president. A brilliant strategist and fearless leader, George was also, apparently, a poet. This acrostic (presumed unfinished, since there are no lines for "NDER,” which would finish spelling out "ALEXANDER"), was written when he was 17 to a young woman named Frances Alexander. It was found in a notebook that the young surveyor used as a diary during an expedition in Virginia in 1749. There are those who don?t believe George actually wrote this—that he, perhaps, simply copied it into his diary from some other source. We choose to believe it's authentic. Wish we would have a candidate who wrote or at least read poetry. I didn't know GW wrote any poetry. One wonders if such feelings affect ones judgement! Hey-ho! Who'd be a politician. "none can you equal in your bright array" simply means "you can't equal anyone in your bright array," or "you're unparalled." That's the way some people talked, or wrote, in "the olden days." And remember, spelling was not standardized for a long time - think Shakespeare. This is rather sappy sweet, but interesting. I felt the "smart" when I injected this morning. Well, he said he would never tell a lie, though that itself was probably a lie. He was a politician, after all. I would like to see Presidents writing poems in place of some of the stuff they say, however. Maybe her second name was Alexa.